1 . Double Tap Fingerprint Sensor to lock the main screen. 2 . 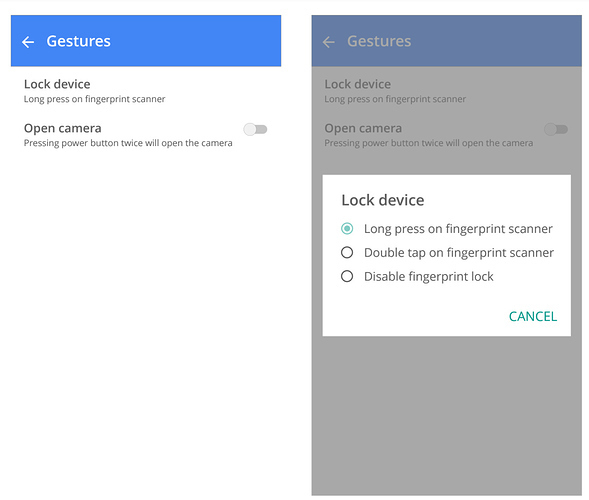 Long Press Fingerprint Sensor to lock the main screen. Double click is better than long press. Long press is difficult to differentiate from short press. I never expected this kind of exlanation on this feature. Plz @smartron let us know when the update is coming? Obviously double or even maybe triple click. Or better let the user decide number of clicks or long press..
@CHALLARAMESH @VardhmanRanjan @stonecold @NSvas @vg123 Both options will be available. You can choose the option according to your wish. Locking can be done by any finger? I guess that's nice right? When the next ota update ? Plz add call recording feature & Beauty mode shelfi on this update .. If you want the app you can install from play store. But do remember ram cleaner will slow down the phone. Once you click on clean, it'll clean but your mobile will slow down in slow manner. For Android till date, there is no need of security application. You need to wait. There is no other way to get the ota update. @Manoj_reddy I will wait bro but what would be the problem ? This is as per one of the mobile brand. Updates will be based on IMEI number and date of purchase from launch date. Note: This is a reply from a mobile brand. Not on my own. I don't know the strategy of @smartron.